Sailors' superstitions have been superstitions particular to sailors or mariners, and which traditionally have been common around the world. Some of these beliefs are popular superstitions, while others are actually better described as traditions, stories, folklore, tropes, myths, or legend. The origins of many of these superstitions are based in the inherent risks of sailing, and luck, either good or bad, as well as portents and omens that would be given associative meaning in relation to the life of a mariner, sailor, fisherman or a crew in general. Even into the 21st century, "fishers and related fishing workers" still have amongst the most dangerous jobs, with the second highest rate of mortality only after loggers. By far the best known sailors' superstitions involve bad luck. Sailors are taught if the sunrise is red to take warning. The day ahead will be dangerous. "Red Sky at night, Sailors delight; Red Sky in the morning, Sailors take warning." The saying is "Red in the morning, sailors take warning. Red at night, sailor's delight." There is no mention of sky. A "Jonah" is a long-established expression among sailors, meaning a person (either a sailor or a passenger) who is bad luck, which is based on the Biblical prophet Jonah. The comic character Jonah's name is a direct reference to the long established sailor's superstition. This concept is prominent in the film Master and Commander: The Far Side of the World. The Dies Infaustus, on which old seamen were desirous of not getting under weigh, as ill-omened. (Dies Infaustus means "unlucky day".) This superstition is the root of the well-known urban legend of HMS Friday. Sailors are often reluctant to set sail on Candlemas Day, believing that any voyage begun then will end in disaster. This may be related to the superstition to remove all Christmas decorations by Candlemas, a practice done well into Victorian times. In 18th century New England, rolling clouds and roaring waves were thought as bad omens, so sailing on days under such conditions was considered inadvisable. 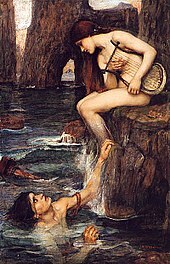 The Siren, by John William Waterhouse (circa 1900), depicted as a fish-chimera. Sirens were mythological, often dangerous and beautiful, creatures, portrayed as femmes fatales who lured nearby sailors with their enchanting music and voices to shipwreck on the rocky coast of their island. They were portrayed in both Greek and Roman mythology as sea deities who lured mariners, and in Roman lore were daughters of Phorcys. 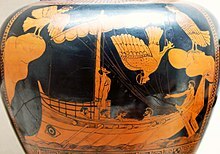 In the Odyssey, the hero Odysseus, wishing to hear the sirens' seductive and destructive song, must protect himself and his crew by having his fellow sailors tie him to the mast and then stop their own ears with wax (see image). In another myth, Hera, queen of the gods, persuaded the Sirens to enter a singing contest with the Muses, which the Sirens lost; out of their anguish, writes Stephanus of Byzantium, the Sirens turned white and fell into the sea at Aptera ("featherless"), where they formed the islands in the bay that were called Souda (modern Lefkai). Another mythological creature, the Scylla, is a similar female sea demon that is both dangerous yet beautiful. Sirens supposedly "lured mariners to their deaths with their melodious, enchanting song", while "Scylla sent countless sailors to the depths of the sea." The albatross as a superstitious relic is referenced in Samuel Taylor Coleridge's well-known poem The Rime of the Ancient Mariner. It is considered very unlucky to kill an albatross; in Coleridge's poem, the narrator killed the bird and his fellow sailors eventually force him to wear the dead bird around his neck. Having bananas on a ship, especially on a private boat or fishing yacht, is considered bad luck. Whistling is usually considered to be bad luck with the possible exception of the sources mentioned below. It is said that to whistle is to challenge the wind itself, and that to do so will bring about a storm. Another tale is that it has been considered bad luck ever since the mutiny aboard HMS Bounty; Fletcher Christian is said to have used a whistle as the signal to begin the mutiny against Captain William Bligh. Sailors also had a culture of items or practices that were believed to bring good luck, or trinkets to ward off bad luck or the evil eye. Tiddles, a black cat who gained fame as a Royal Navy ship's cat. While in many cultures, a black cat is considered unlucky, British and Irish sailors considered adopting a black "ship's cat" because it would bring good luck. There is some logic to this belief: cats eat (or at least kill) rodents, which can damage ropes and stores of grain on board, and they are intelligent animals, a high level of care was directed toward them to keep them happy, and research has backed up this superstition. Evidence published in 2017 by a geneticist the University of Leuven shows that Egyptian cats spread their mitochondrial DNA through shipping lanes to medieval northern Europe. Preliminary results of that genetic study concluded that cats were also carried on trading ships to control rodents, and that practice was adopted by traders from other nations, including Vikings in northern Germany around the 8th to 11th centuries. Some sailors believed that polydactyl cats were better at catching pests, possibly connected with the suggestion that extra digits give a polydactyl cat better balance, important when at sea. Cats were believed to have miraculous powers that could protect ships from dangerous weather. Another popular belief was that cats could start storms through magic stored in their tails. If a ship's cat fell or was thrown overboard, it was thought that it would summon a terrible storm to sink the ship and that if the ship was able to survive, it would be cursed with nine years of bad luck. Other beliefs included: if a cat licked its fur against the grain, it meant a hailstorm was coming; if it sneezed it meant rain; and if it was frisky it meant wind. Cormorants, in some Scandinavian areas, are considered a good omen; in particular, in Norwegian tradition spirits of those lost at sea come to visit their loved ones disguised as cormorants. Whistling on board a sailing ship is thought to encourage the wind strength to increase. This is regularly alluded to in the Aubrey-Maturin books by Patrick O'Brian. On boats and ships where whistling was taboo, the cook was usually excused, because as long as he was whistling, he was not stealing the food. A Klabautermann on a ship, from Buch Zur See, 1885. Traditionally, a type of kobold, called a Klabautermann, lives aboard ships and helps sailors and fishermen on the Baltic and North Sea in their duties. He is a merry and diligent creature, with an expert understanding of most watercraft, and an irrepressible musical talent. He also rescues sailors washed overboard. The name comes from the Low German verb klabastern meaning "rumble" or "make a noise". An etymology deriving the name from the verb kalfatern ("to caulk") has also been suggested. A carved klabautermann image, of a small sailor dressed in yellow with a tobacco pipe and woollen sailor's cap, often carrying a caulking hammer, is attached to the mast as a symbol of good luck. However, despite the positive attributes, there is one omen associated with his presence: no member of a ship blessed by his presence shall ever set eyes on him; he only ever becomes visible to the crew of a doomed ship. The belief in Klabautermänner dates to at least the 1770s. Sailors have had several patron saints. According to his hagiography, Saint Nicholas calmed a storm by prayer. Brendan the Navigator is also considered a patron saint of sailors and navigators, due to his mythical voyage to St. Brendan’s Island. Erasmus of Formiae, also known as Saint Elmo, may have become the patron of sailors because he is said to have continued preaching even after a thunderbolt struck the ground beside him. This prompted sailors, who were in danger from sudden storms and lightning, to claim his prayers. The electrical discharges at the mastheads of ships were read as a sign of his protection and came to be called "Saint Elmo's Fire". Thus, Saint Elmo's Fire was usually good luck in traditional sailor's lore, but because it is a sign of electricity in the air and interferes with compass readings, sailors sometimes regarded it as an omen of bad luck and stormy weather. The mariner's cross, also referred to as St. Clement's Cross, is worn by many sailor's to bring blessings. It is often considered lucky to touch the collar of a sailor's suit. Mermaids usually are considered lucky, but not universally. In Trinidad and Tobago, sea-dwelling mer-men "were known to grant a wish, transform mediocrity into genius and confer wealth and power." Hans Christian Andersen's fairy tale "The Little Mermaid" was published in 1837. The story was adapted into a Disney film with a bowdlerized plot. In the original version, The Little Mermaid is the youngest daughter of a sea king who lives at the bottom of the sea. To pursue a prince with whom she has fallen in love, the mermaid gets a sea witch to give her legs and agrees to give up her tongue in return. Though she is found on the beach by the prince, he marries another. Told she must stab the prince in the heart to return to her sisters, she can't do it out of love for him. She then rises from the ocean and sees ethereal beings around her who explain that mermaids who do good deeds become daughters of the air, and after 300 years of good service they can earn a human soul. A world-famous statue of the Little Mermaid, based on Andersen's fairy tale, has been in Copenhagen, Denmark since August 1913, with copies in 13 other locations around the world. Sailors would look for mermaid's purses on beaches for signs of mermaids in the area. An illustration from the original 1870 edition of Twenty Thousand Leagues Under the Sea by author Jules Verne. Davy Jones is a popular character in sailor's yore, especially of the gothic fictional variety. 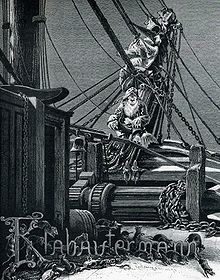 Davy Jones' Locker is an idiom for the bottom of the sea: the state of death among drowned sailors. It is used as a euphemism for death at sea (to be sent to Davy Jones' Locker). The origins of the name are unclear, and many theories have been put forth, including an actual David Jones, who was a pirate on the Indian Ocean in the 1630s; a pub owner who kidnapped sailors and then dumped them onto any passing ship; the incompetent Duffer Jones, a notoriously myopic sailor who often found himself over-board; or that Davy Jones is another name for Satan; or "Devil Jonah", the biblical Jonah who became the "evil angel" of all sailors, who would identify more with the beset-upon ship-mates of Jonah than with the unfortunate man himself. Upon death, a wicked sailor's body supposedly went to Davy Jones' locker (a chest, as lockers were back then), but a pious sailor's soul went to Fiddler's Green. This nautical superstition was popularized in the 19th century. Kraken were legendary sea monsters that may have been based on sightings of giant squids. In relation to language and cultural practices, such sailors superstitions are the consequence of folkloric practices or traditions whose meanings were once important signifiers, but now are lost to most modern sailors and laypersons alike. For example, the images of a pig and a hen were good luck; both animals are not capable of swimming, but they believed that God would look down upon a shipwreck and see an animal not capable of swimming and would take them into his hand and place them on land. In Reality, most of the smaller livestock aboard ships would float in their wooden crates and would be among the only survivors of wrecks, adding further reason to getting the tattoos on sailors feet, as it was believed to help them survive a wreck. Another example of superstitions is the North Star (Nautical Star or compass rose); sailors had the belief that by wearing this symbol it would help them to find his or her way home. Sailors designed mariner motifs of their own, according to their travel experiences in the ocean. 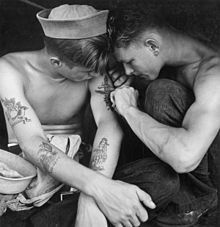 By the 19th century, about 90% of all United States Navy sailors had tattoos. The anchor is commonly used in sailor tattoos. U.S. Sailors and Marines participate in a line-crossing ceremony aboard USS Blue Ridge (LCC-19) as the ship passes the Equator May 16, 2008. It has been a long naval tradition to initiate pollywogs, sailors who have never crossed the Equator, into the Kingdom of Neptune upon their first crossing of the Equator. The Line-crossing ceremony commemorates a sailor's first crossing of the Equator. Its practices invoke good luck on the new sailor. The ceremony of Crossing the Line is an initiation rite in the Royal Navy, Royal Canadian Navy, U.S. Navy, U.S. Coast Guard, U.S. Marine Corps, and other navies that commemorates a sailor's first crossing of the Equator. The tradition may have originated with ceremonies when passing headlands, and become a "folly" sanctioned as a boost to morale, or have been created as a test for seasoned sailors to ensure their new shipmates were capable of handling long rough times at sea. Sailors who have already crossed the Equator are nicknamed (Trusty) Shellbacks, often referred to as Sons of Neptune; those who have not are nicknamed (Slimy) Pollywogs (in 1832 the nickname griffins was noted ). After crossing the line, Pollywogs receive subpoenas  to appear before King Neptune and his court (usually including his first assistant Davy Jones and her Highness Amphitrite and often various dignitaries, who are all represented by the highest ranking seamen), who officiate at the ceremony, which is often preceded by a beauty contest of men dressing up as women. Afterwards, some wogs may be "interrogated" by King Neptune and his entourage. During the ceremony, the Pollywogs undergo a number of increasingly embarrassing ordeals (such as wearing clothing inside out and backwards; crawling on hands and knees; being swatted with short lengths of firehose; kissing the Royal Baby's belly coated with axle grease, etc. ), largely for the entertainment of the Shellbacks. Once the ceremony is complete, a Pollywog receives a certificate  declaring his new status. Marvelous costumes in which King Neptune and Queen Aphrodite [sic.] and their court appeared. The Pollywogs were given an intensive initiation lasting two days, but we have all survived and are now full-fledged Shellbacks"
As of 1/1/16[update] some cruise ships also have a line-crossing ceremony for their passengers. The phrase over a barrel, meaning to be in a dilemma or "a weak or difficult position", may refer to the first aid practice amongst sailors of placing a drowning victim's head over a barrel, and rolling his body over it, in an attempt to remove aspirated water from the person's lungs. 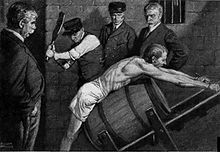 However, this etymology is challenged, and may come instead from the custom of punishing a prisoner by flogging or paddling him while he is strapped to a barrel; there is no documentary evidence it was actually used specifically as a nautical phrase. Either way, the image created in the mind is that of total helplessness and loss of control, which is a common anxiety of sailors in fear of corporal punishment. ^ Johnson, David (May 13, 2016). "The Most Dangerous Jobs in America". Time. Retrieved May 23, 2016. ^ "Merriam-Webster Online, dies infaustus". Retrieved 2008-09-27. ^ "Twelfth Night and Decorations". Archived from the original on 2016-04-12. Retrieved June 7, 2016. ^ McCullough, David (2001). John Adams. New York: Simon & Schuster. p. 178. ISBN 0-684-81363-7. ^ a b c Karoglou, Kiki (2018). "Dangerous Beauty: Medusa in Classical Art". The Metropolitan Museum of Art Bulletin. No. Winter 2018. pp. 36–43. ^ Virgil. V. 846; Ovid XIV, 88. ^ See also Argonautica (4.891–919); Odyssey XII, 39; Hyginus, Fabulae 141; Lycophron, Alexandra 712 ff. ^ Caroline M. Galt, "A marble fragment at Mount Holyoke College from the Cretan city of Aptera", Art and Archaeology 6 (1920:150). ^ Mikkelson, Barbara (November 13, 2012). "Banana Ban". Snopes.com. Retrieved November 15, 2012. ^ Eyers, Jonathan (2011). Don't Shoot the Albatross! : Nautical Myths and Superstitions. London: A & C Black. ISBN 978-1-4081-3131-2. ^ de Vries, Ad (1976). Dictionary of Symbols and Imagery. Amsterdam: North-Holland Publishing Company. pp. 85–86. ISBN 0-7204-8021-3. ^ Newitz, Annalee (19 June 2017). "Cats are an extreme outlier among domestic animals". ArsTechnica. Retrieved 24 June 2017. ^ Briggs, Helen (19 June 2017). "How cats conquered the ancient world". BBC News. Retrieved 19 June 2017. ^ "Cats sailed with Vikings to conquer the world, genetic study reveals". www.sciencealert.com. Science Alert. 23 September 2016. Retrieved 3 October 2016. ^ Dunwoody, H. H. C. (1883). "Proverbs relating to animals". Signal Service Notes: Weather Proverbs. Washington: Office of the Chief Signal Office. pp. 29–30. ^ Arin Murphy-Hiscock (18 January 2012). Birds - A Spiritual Field Guide: Explore the Symbology and Significance of These Divine Winged Messengers. Adams Media. pp. 48–49. ISBN 1-4405-2688-5. ^ Leander Petzoldt, Kleines Lexikon der Dämonen und Elementargeister, Becksche Reihe, 1990, p. 109. ^ Melville, F., The Book of Faeries (2002 Quarto Publishing). ^ Ellett, Mrs. (Jan. 1846). "Traditions and Superstitions", The American Whig Review: A Whig Journal, Vol. III. New York: George H. Colton. pp. 107-108. ^ Rose, Carol (1996). Spirits, Fairies, Leprechauns, and Goblins: An Encyclopedia. New York City: W. W. Norton & Company, Inc. ISBN 0-393-31792-7. p. 181. ^ "The Story of St. Nicholas". Episcopal Relief. Retrieved December 9, 2015. ^ a b Eyers, Jonathan (2011). Don't Shoot the Albatross! : Nautical Myths and Superstitions. A&C Black, London, UK. ISBN 978-1-4081-3131-2. ^ Beliefs often can be contradictory. For example, St. Elmo's fire is reported to have been seen during the Siege of Constantinople by the Ottoman Empire in 1453. It reportedly was seen emitting from the top of the Hippodrome. The Byzantines attributed it to a sign that the Christian God would soon come and destroy the conquering Muslim army. According to George Sphrantzes, it disappeared just days before Constantinople fell, ending the Byzantine Empire. ^ Stracke, Richard (2015-10-20). "Saint Clement: The Iconography". Christian Iconography. ^ n.a. (n.d.). "Folktales & Superstitions". Visit Trinidad and Tobago. Retrieved August 6, 2013. ^ Hans Christian Andersen (2007-12-13). "The Little Mermaid". Hca.gilead.org.il. Retrieved 2012-07-21. ^ Aeppel, Timothy (July 27, 2009). "In a Mermaid Statue, Danes Find Something Rotten in State of Michigan". The Wall Street Journal. Dow Jones & Company. Archived from the original on July 27, 2009. Retrieved 2012-11-19. ^ "The Little Mermaid – Downtown Public Art Circuit tour". The City of Calgary. Archived from the original on 2012-04-10. Retrieved 2012-02-11. ^ "Mermaids of Earth". Philip Jepsen. Retrieved May 6, 2013. ^ "Davy Jones's Locker". Bartleby.com. The American Heritage Dictionary of the English Language: Fourth Edition. 2000-01-01. Archived from the original on May 6, 2006. Retrieved 2006-07-16. ^ Rogoziński, Jan (1997-01-01). The Wordsworth Dictionary of Pirates. Hertfordshire. ISBN 1-85326-384-2. ^ a b c Dunne, Susan (2006-07-07). "Davy Jones Legacy". The Hartford Courant. Retrieved 2006-09-30. ^ Brewer, E. Cobham (1898-01-01). "Davy Jones's Locker". Dictionary of Phrase and Fable. Retrieved 2006-04-30. ^ Ellison, Jake (January 7, 2013). "Live giant squid! Discovery Channel says it's got first videos". SeattlePi.com. ^ "The Top 10 Superstitions About Boating". Retrieved 2014-08-14. ^ "Religious Designs". Tattoo Archives. 2000. Archived from the original on August 13, 2012. Retrieved July 24, 2012. ^ "Sailor Tattoos, Become a Cool Mariner". Marine in Sight. Retrieved 13 April 2012. ^ Finan, Eileen (Apr 22, 2002). "Is Art Just Skin Deep?". Time Magazine World. Retrieved 16 April 2012. ^ "More roses, less guns, and plenty of pin-up girls: Australian sailors explain their love of body art". News.Com.Au. November 10, 2014. Retrieved December 8, 2014. ^ Robert FitzRoy (1839) Narrative of the surveying voyages of His Majesty's Ships Adventure and Beagle between the years 1826 and 1836, London: Henry Colburn. pp. 57–58. ^ Keynes, R. D. ed. (2001) Charles Darwin's Beagle diary, Cambridge University Press, pp. 36–38. ^ Cook, Blanche (1999). Eleanor Roosevelt, vol. 2 (1933-1938). New York: Penguin. p. 398. ISBN 978-0140178944. ^ "Cruise Critic". October 26, 2006. Retrieved May 23, 2016. ^ "Over a barrel". The American Heritage Dictionary of Idioms. Houghton Mifflin. 2003. Retrieved April 13, 2017. ^ a b Wilton, David (December 26, 2006). "Over a barrel". Wordorigins.org. Retrieved April 13, 2017. ^ Martin, Gary (December 26, 2006). "Over a barrel". The Phrases Finder (UK). Retrieved April 13, 2017.